FINAL FISHES FROM OUR FEAST! 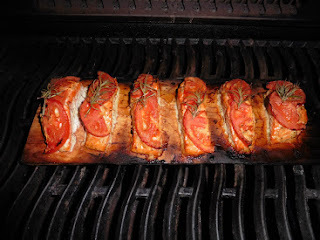 Years ago I plank-grilled salmon with my brother, Skip and we loved it. Not sure why I don't do this dish more often, but after having this Christmas Eve treat added to our Feast I sure am going to try it again soon! Dennis was the chef behind this beautiful dish. 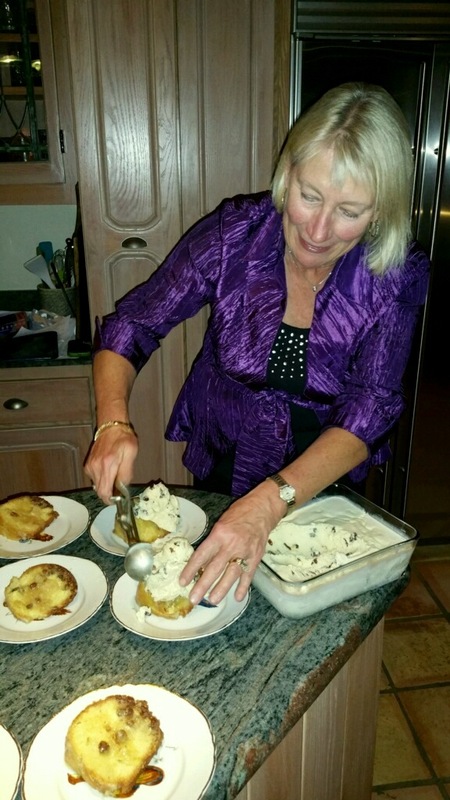 He does most of the cooking in their household, but his wife is also an excellent cook. They make a great team! Soak cedar grilling plank in water for 2-4 hours. About 20 minutes before you're ready to grill, preheat grill to medium. Season salmon with 1/2 tsp. salt and let stand while the grill preheats. Combine yogurt with 1 Tbsp. oil, orange juice, tarragon and the remaining pinch salt in a medium bowl. Whisk vigorously until all the oil has been incorporated into the yogurt. When ready to grill, brush the salmon with the remaining 1 Tbsp. oil. Place the soaked cedar plank directly over the fire for about 1 minute. Using tongs, turn the plank over to expose the slightly charred side. Place the salmon fillet skin-side down on the plank. Cover the grill and cook until the salmon is easily flaked with a fork, about 7-10 minutes. Remove the entire plank from the grill and serve it or transfer the salmon to a serving platter. Serve the salmon with the sauce. This is the original recipe. As you can see from picture above, Dennis adapted by adding thin slices of tomato topped with fresh tarragon on each piece of salmon before grilling. He also cut the salmon prior to cooking which made it much easier to serve. A lovely dish! Thank you! Dennis served this dish with a very interesting limited edition sparkling wine. NV KORBEL BRUT ROSE "LIPS CHAMPAGNE". Wow, was that the perfect pop for this elegant course. The wine contains five grape varieties: pinot noir, sangiovese, gamay, zinfandel, and chenin blanc. OoooLaLa! I also cannot wait to make this dish. Rich, bursting with flavor and hard to stop eating...that is always a good sign! Thanks for bringing this to our table! 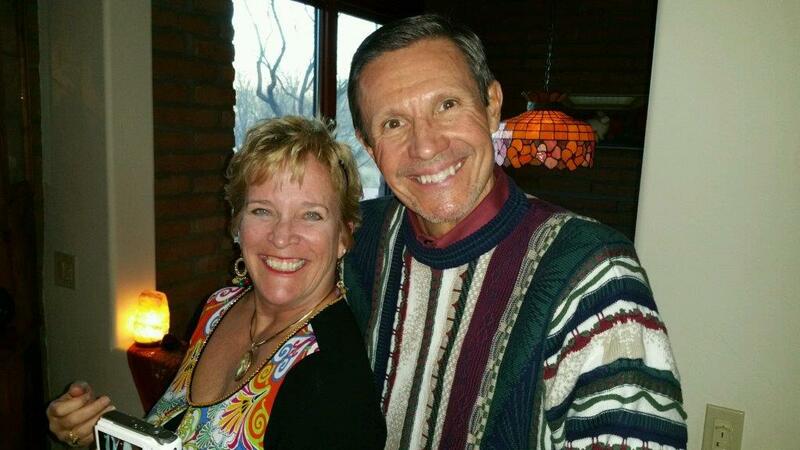 Deb and her husband Steve also make an excellent team! 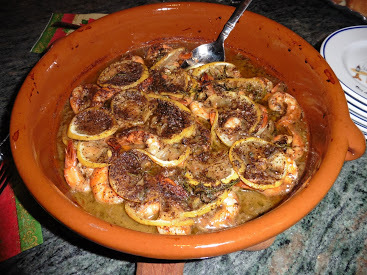 In a large shallow glass pan place shrimp in single layer, cover with sliced lemons. In sauce pan heat remaining ingredients to boil. Pour over shrimp, cover and refrigerate overnight. Bring dish to room temp before baking. Bake in preheated 450 degree oven for 20 minutes. Enjoy with crusty bread for dipping up the sauce. We ended our Feast with dessert, which I am guessing no one was really interested in at this point, but I persuaded them to go for it! 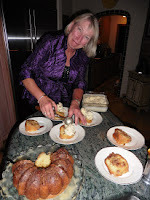 THE RUM CAKE...A few years ago, my Dad's good neighbor, Karen made him an unbelievable rum cake for Christmas. He was sure he was getting a little buzz on each time he had a piece. I did a bunch of research to find the recipe and finally while getting a pedicure here in Nogales was speaking with a lovely women who said her sister-in-law makes the BEST rum cake in the county. This is her recipe which looks very much like the original Bacardi Rum Cake recipe. It sure was moist and delicious! Preheat oven to 350 degrees. Grease and flour a bundt cake pan. Sprinkle nuts over bottom of pan. Sprinkle a couple Tbsp. brown sugar over the nuts. Mix all cake ingredients together. Pour batter into pan over nuts. Smooth out the top to make even. Bake for 1 hour, or a little less if the pan is black. Do not over-bake! While cake has ten minutes to go, make the glaze. Melt butter in saucepan. Stir in water and sugar. Boil 4-5 minutes, stirring constantly. Turn off flame and pour in rum. Stir to combine and reheat for 30 seconds. Remove cake from oven. Immediately drizzle 1/3 of the glaze on the bottom (which currently is the top) of the cake. Allow to sit for 5 minutes. Invert the cake onto a serving plate. Prick surface a hundred times with a fork very gently. Slowly drizzle remaining rum glaze all over the top of the cake, allowing it to drip down the sides. Cool to room temp before serving to ensure glaze has soaked in. This cake got even better over the next couple days! And, finally here is the recipe for the Rum Raisin Ice Cream. I must say there were several steps in making this ice cream and it took a few days preparation, but definitely well worth the effort. Rum Raisin is one of my favorite flavors and this was an excellent example of this luscious ice cream! I found this recipe online at the Serious Eats site. This photo is from their site. 1 cup raisins (dark or golden) I used dark. Place the raisins in a container with a tight-fitting lid and add rum. Cover and shake to evenly coat raisins in rum. Let sit at room temperature at least overnight and up to 2 days. The longer they sit, the more they absorb the rum. I let mine sit for 2 days and the rum was gone! After they have set up if you have any rum left, drain off reserving 2 Tbsp. I just added 2 more Tbsp. of rum. Combine milk, cream, sugars, cinnamon, and salt in a medium saucepan and place over medium heat, stirring occasionally until mixture is steaming and sugars are dissolved. Meanwhile, whisk egg yolks in medium bowl. Gradually whisk hot liquid into yolks, then scrape back into pan and cook over medium heat, stirring constantly until mixture is thick enough to coat the back of a spoon (or until the temperature reaches 170-175 degrees). Strain through a fine mesh sieve and chill thoroughly or overnight. 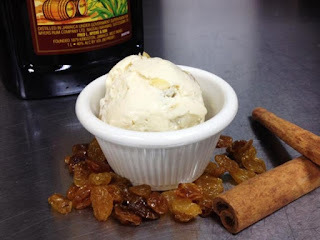 Add vanilla and reserved rum to base and process in ice cream machine according to manufacturers instructions, adding raisins when almost fully churned. Remove to freezer-safe container and seal tightly. Freeze at least 24 hours before serving. I hate to see this wonderful celebration end, but the very good news is that it will live on in our memories and hopefully you all might enjoy trying one or two of these recipes, too! 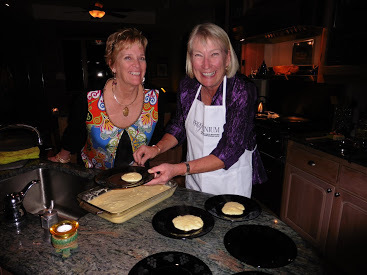 THANK YOU for sharing my love of cooking. Make it fun. Don't stress. Enjoy every moment in your kitchen! This photo is apropos of NOTHING, but I loved this '49 Buick Super Convertible that we owned for many years. It is the car they used in the Rain Main movie. 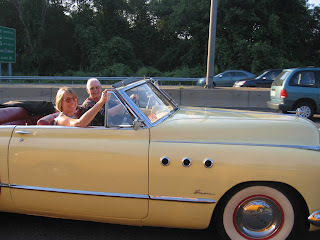 and even drove it one year from Boston to Ohio for a car show! Today I am going to share 3 more fishes dishes and leave the 2 guest dishes and dessert for last! For those who missed the last blog, I began talking about our NOUVEAU NON-TRADITIONAL FIESTA OF THE SETTE PESCI, or the classic Italian Christmas Eve dinner called, Feast of the Seven Fishes. We had a lot of Italian influence, but also traveled over into France, and included some American favorites in both the food and wine categories. First, I'd like to share our third dish which is so simple it really doesn't need a recipe. 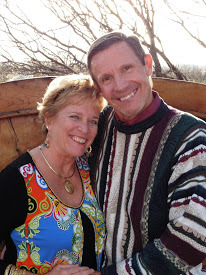 We live in Southern Arizona near a wonderful little gourmet market that offers really fresh and delicious fish, including cod fish shipped in twice a week from Boston. If you're in the area check out the Tubac Market (http://www.tubacmarketaz.com/) . That is where I also got the swordfish we're going to talk about later. I cut about a 2" square piece of cod fish for each serving. Remember we did have seven+ courses! It's important to thoroughly dry the fish before beginning to sear and I keep it at room temp for about a half hour before cooking. To cook vegetable base: I cooked the vegetables ahead of time by getting a big frying pan to high heat with about 2 Tbsp. olive oil and 2 Tbsp. butter. Add a pint of cherry tomatoes, rinsed, but not cut and 4 cloves minced garlic, salt/pepper to taste. Let this cook down until the tomatoes start to split. Next add the spinach. In this case because I had 6 guests I added 6 big handfuls of spinach to the pan. Cook until just wilted, for about 2 minutes, and remove from heat. Set aside and reheat while you're cooking the cod fish. To cook fish: Salt both sides liberally and sprinkle lightly with white pepper. Place a large frying pan over high heat also using 2 Tbps. olive oil and 2 Tbsp. butter. Let it get bubbling, but not browned. Keep heat high and sear each side for about 3-4 minutes depending on the thickness of your fish. It will 'give' when you touch with your finger, but not be either too soft (underdone) or too hard (overdone). Serve at once on the bed of veg. With this course we had a very fun sparkling rose from Veneto Italy. Foss Marai, Roos is a dry sparkling rose with light strawberry and pear flavors. Diana, Debbie and me getting ready to serve! Make the red sauce ahead of time or use bottled. Make the bread ahead of time and freeze. Take bread out morning of your party and heat for about 15 minutes while assembling the dish. I found this recipe online, but have forgotten what site. Calamari heading to the dining room! Cut squid bodies into 1/2 inch rings. If tentacles are large, cut them in half vertically. Set aside. Heat olive oil and butter together in a large saute pan. Add garlic and cook over medium-high heat for about 5 minutes. Add tomato sauce, 1/4 cup water, and white wine. Cook sauce over high heat for another 5 minutes, until it reduces and thickens. Add all, but 1 Tbsp. parsley to the tomato sauce, lower heat, and simmer, uncovered for about 15 minutes. Meanwhile bring a large pot of salted water to boil, then add pasta and cook until tender;7-9 minutes; Bucatini takes a little longer because it's thicker. Drain well, shaking colander gently to remove excess moisture. Add calamari to tomato sauce, then remove from heat and allow to stand, covered for 3-4 minutes. Add salt/pepper to taste. Add drained pasta and toss well. Garnish with remaining parsley and serve. If you're using bottled sauce or sauce you made ahead of time all you have to do is thaw the calamari in a colander. Once completely thawed pour the calamari on paper towels to get out additional excess moisture. Drop them in the sauce for 3-4 minutes, as above. So easy! This is from the famous Sicilian chef, Lydia Bastianich. Any recipe of hers you find I think you will love! I made the delicious base for the swordfish a day ahead. This doesn't look that pretty, but it sure was good! Heat 1/2 cup olive oil and saute garlic on medium heat. Remove from stove and add parsley, rosemary, and thyme. Mix the herbs and add bread crumbs, lemon zest, lemon juice salt and pepper. Let cool. Season the fish with salt/pepper, dust with the breadcrumb mixture, and grill (I pan seared.) evenly about 4 minutes each side until firm, but not hard. Saute the onions in olive oil on medium heat until translucent. Pit the olives (or use pitted, much easier!) and cut them in half. Toss the olives in right before finishing the onions. Place swordfish steaks on a platter and cover with the onion/olive mixture. Serve with lemon wedges. The wine that accompanied our Pesce Spada was from Tuscany. 2012 Castello della Paneretta Chianti Classico. Dry, medium-bodied with fruit and earth balanced flavors of dried dark fruit; cranberry; leather, and hints of cinnamon. I've been told that in the Western part of Sicily they freeze their granita as I did in a pan in the freezer, stirring until iced. On the Eastern side they churn like a regular ice cream. With vegetable peeler, remove zest in long pieces from 2 lemons. Squeeze 1/2 cup juice from lemons. You may need an additional lemon for the fine zest garnish (Use a micro-plane.). In a small heavy saucepan heat water and sugar, stirring until sugar is dissolved. Stir in large pieces of zest and transfer syrup to a bowl to cool. Chill syrup, covered until cold. Discard zest and stir in lemon juice. 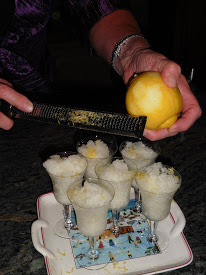 For Western style Granita, freeze lemon mixture in a metal bowl (I prefer a flat, 2" thick metal cake pan. It freezes better and is easier to stir.) Stir with a fork every 30 minutes to remove ice crystal from side of the bowl or pan, until liquid has become granular, but is still slightly slushy, about 3-4 hours. Serve immediately. New Year's resolution of MODERATION! 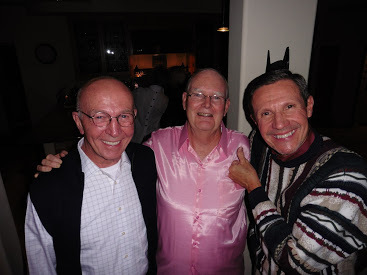 Here are few more party pix to close today's blog. Thanks for sharing this wonderful evening with me! of our Christmas Eve extravaganza! FEAST OF THE SEVEN FISHES! 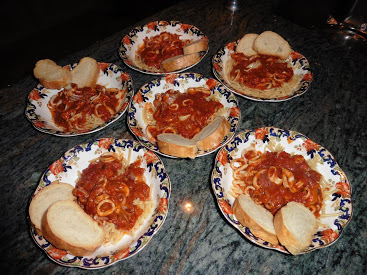 For Christmas Eve this year I put together a very non-traditional Feast of the Seven Fishes. 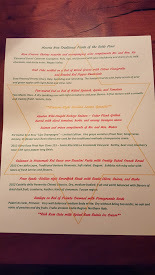 I apologize to all my traditional Italian friends who may cringe when they see the menu! That's a little hard to read so I will go through each of the courses a few at a time. First, a little history on the tradition behind this Feast! The Feast of the Seven Fishes is part of the Italian-American Christmas Eve celebration. It started in the southern part of Italy (Naples and Sicily). Christmas Eve is a vigil or fasting day, and the abundance of seafood reflects the tradition of abstinence from red meat until the actual feast of Christmas Day itself. 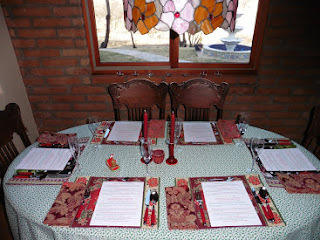 We may not have eaten red meat, but there was not a lot of abstinence at our table either! 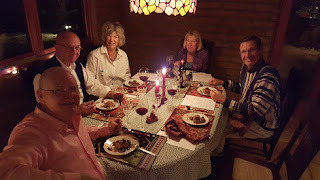 Clockwise from front: My husband Jerry, Steve V., Deb V., Moi, Dennis M., his wife Diana is snapping the photo. These days, in America, the meal typically consists of seven different seafood dishes, although there is much lore and variation around the actual number of courses with different religious significance to each number. Many of the traditional dishes are not on my menu; like pupa (octopus), baccala (salt cod), fried eel, smelt, and scungilli (conch). In southern Italy the Feast is known simply as The Vigil (La Vigilia). This celebration commemorates the wait, the Viglia di Natale, for the midnight birth of the baby Jesus. And in keeping with tradition our Feast did go on until midnight! My good friend Debbie brought a fabulous shrimp starter accompanied by a delicious cabernet sauvignon from Nappa Valley, 'Educated Guess'. I will share the recipe with you in a future blog. It was a perfect way to start our festive celebration! 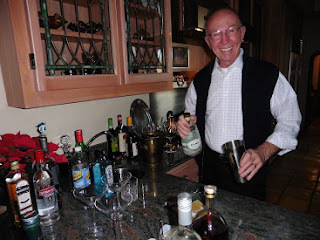 While her dish was heating, her husband Steve served as bar tender and fixed up some tasty cocktails. Thanks Steve for a PERFECT martini! Our first seated course (technically the second fishes dish) was a Crab Cake. I have made this recipe many times. What I love about it: all crab; very little bread. The recipe is from '21' Club in New York City. I have not eaten there, but would love to some day. The chef at '21' Club uses a squeeze bottle to make the roasted red pepper squiggles, but I could not find my squeeze bottle so filled a zip lock baggie with the roumelade, snipped a corner of the bag, and squeezed the sauce out through it. My squiggles don't look very pretty, but it sure was good. This was my favorite course. In a skillet heat 1 Tbsp. oil over moderately high heat until hot, but not smoking. Saute bell peppers until softened. Cool peppers. In a food processor grind bread into fine crumbs. In a bowl stir together bell peppers, crab, cilantro (if using), 1/4 cup mayonnaise (mustard, if using), Old Bay seasoning, jalapeno, garlic, 2 Tbsp. bread crumbs, black pepper and salt to taste. Chill 20 minutes. With a 2 oz. ice cream scoop (or just use a large spoon or 1/4 cup measure to create equal sized cakes), scoop crab mixture into 8 portions and pat each into 3/4 inch thick cakes. Spread remaining bread crumbs on a sheet of wax paper and gently press each cake into them, turning it, to coat evenly. 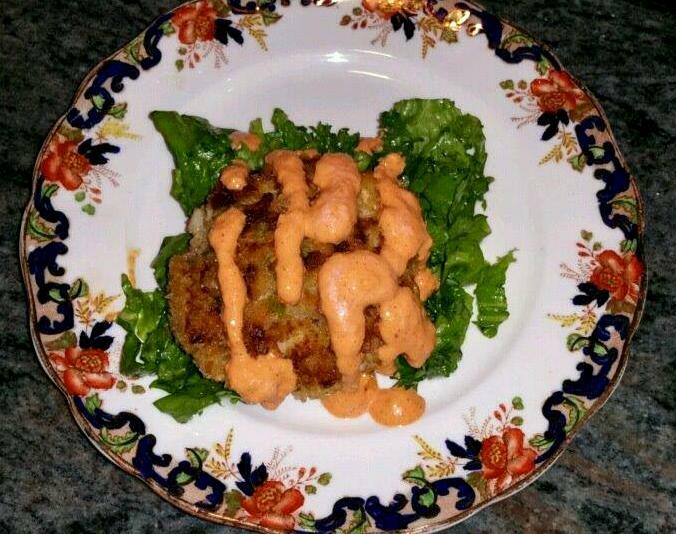 To help prevent crumbling during cooking, chill crab cakes, covered loosely at least hour and up to 1 day. I made the day ahead. In a 12 inch skillet heat 1 Tbsp. oil over moderately high heat until hot, but not smoking and saute half the crab cakes (you don't want to crowd them in the pan or they won't cook evenly) until golden brown, about 3-5 minutes. Turn crab cakes carefully and brown other sides. 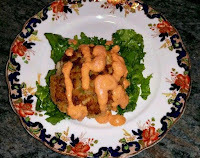 Transfer sauted crab cakes to a baking sheet. Add remaining Tbsp. oil to skillet and saute remaining crab cakes in same manner. 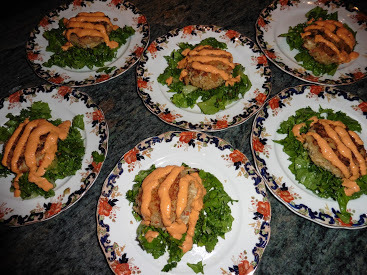 On baking sheet, bake all crab cakes 5 minutes to heat through. Serve with or without topping; with or without salad. Our beverage with this coarse was Enza Proseca/Veneto Doc; sparkling and refreshing with hints of pear and green apple, and light floral and citrus notes. Perfect with the crab! 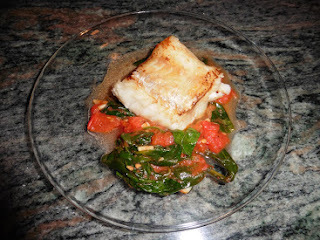 Our third course was pan-seared New England Cod on a bed of wilted spinach, garlic and tomatoes. I am going to save this one for a future blog and move on to my second favorite course...This was actually our last menu item (prior to dessert that is!). 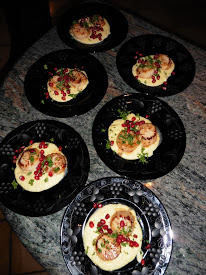 The creation of this recipe is mine, but, I got the recipe for CREAMY BAKED PARMESAN POLENTA on line from the Real Simple site and just had a feeling the scallops would sit well on the polenta and be off-set by the sweet crunch of the pomegranate seeds. I just had a feeling the pomegranate seeds would offer a great "pop" and contrast to the creamy polenta and sublime scallops. Really pleased it all worked! 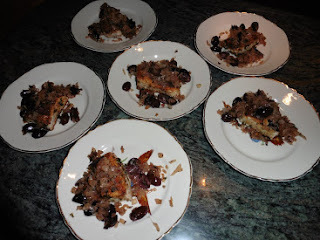 This recipe worked well for this complicated meal as I also was able to prepare the polenta to stage of baking the day before and bake directly before serving night of the party. 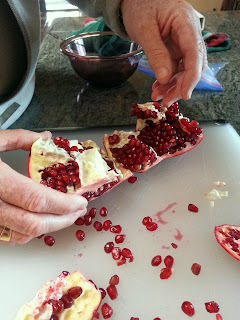 I also seeded the pomegranate the day prior to the Feast. One pomegranate provides many seeds! Who knew?!? The seeds kept well in a zip lock baggie in the fridge for a little more than a week. 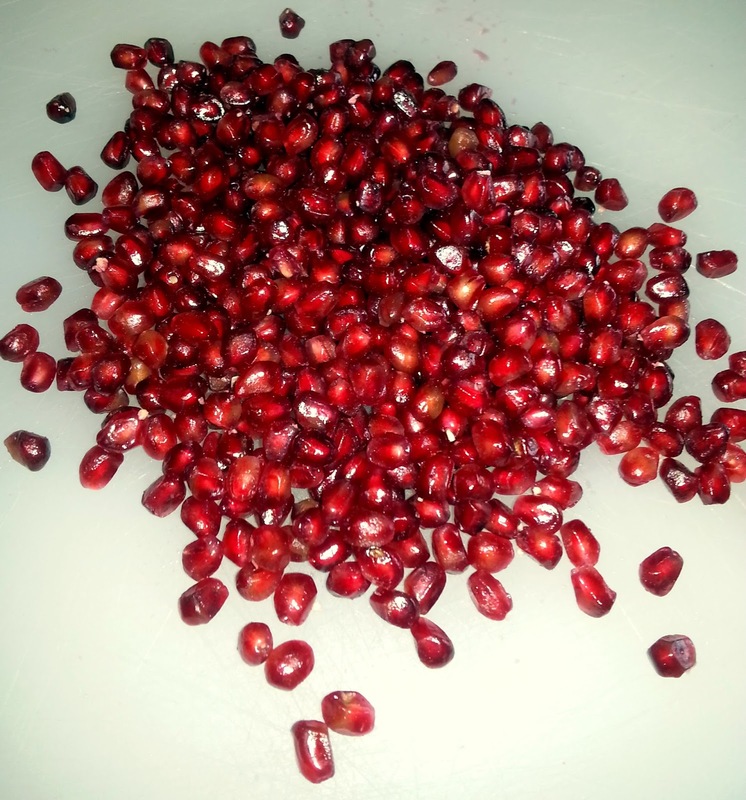 Use them on salads, in sandwiches for an extra crunch or top chicken, pork or other seafood with these beautiful, red seeds! Jerry is pulling apart the pomegranate to remove seeds. Preheat oven to 350 degrees if you are baking right away. If not, wait until ready to bake. Butter a 9x13 inch baking dish. In a large saucepan bring 6 cups water and 2 tsp. salt to boil. Gradually whisk in the polenta. Cook over medium heat, whisking often, until polenta is very thick; 10-15 minutes. Remove form heat and whisk in the butter, eggs, and 1 cup Parmesan. Transfer to the prepared baking dish. Add salt/pepper as needed. Sprinkle top with remaining 1/4 cup Parmesan cheese. Either bake until top is set and golden (30-35 minutes) or cover and keep in refrigerator until ready to bake. Bring to room temperature before baking. Once baked, let sit for 15 minutes before serving. 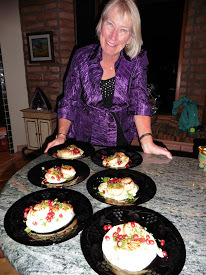 Diana helping to plate and serve the scallops. To sear scallops: Heat a large frying pan on high heat with 1 Tbsp. butter and 1 Tbsp. olive oil. Get it to the smoking point. Dry scallops completely with a paper towel. Salt both sides of scallops liberally. Place scallops in pan (do not crowd) and sear on high heat for about 2 minutes; turn over and sear the other side. The cooking time depends on the size of your scallop. Touch them with your finger. The texture should be supple, but not soft. To plate: Place a scoop of polenta on each plate. Top with 2 scallops and generous amount of pomegranate seeds. Serve. The scallops were served with Poderi di Carlo, Primosic, a very well-balanced white wine from Northern Italy-Fruila-Venezia Ciulla region. I had SO much help prepping, cooking, and serving this Feast from my husband the day before and from all my guests that evening! 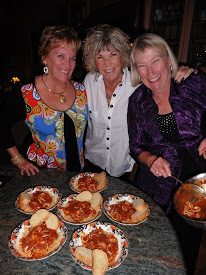 It was truly a group effort and one of the most fun meals I can remember. 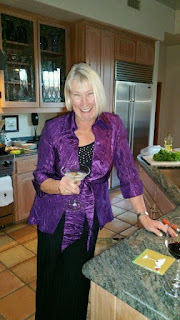 More recipes to come soon! 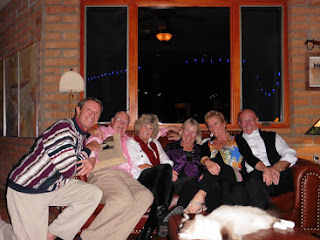 Dennis, Jerry, Deb, me, Diana, and Steve...post Feast...rubbing our bellies. JoJo even looks full! Thank you all for making this evening so much fun! The beauty of this meal is you can serve any one of these dishes as an entrée or mix and match different courses. 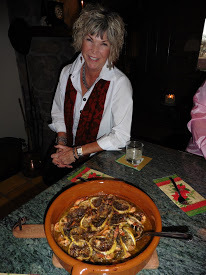 Next time I will share the Calamari in housemade red sauce with home made French Bread; Pesce Spada--one of Lydia Bastianch's famous Sicilian swordfish dishes, and our intermezzo course--Sicilian Lemon Granita. The final Feast blog will include the two fabulous dishes from our guests-Deb's shrimp starter and Dennis's Cedar Planked Alaskan wild-caught Sockeye Salmon. Each course was served with (at least) one wine so we will also discuss those pairings. 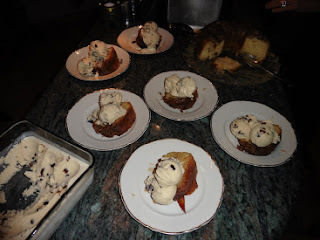 Oh, and of course, we don't want to forget the dessert: Rum Cake with home made rum raison ice cream! MANY OF YOUR OWN FABULOUS FEASTS! 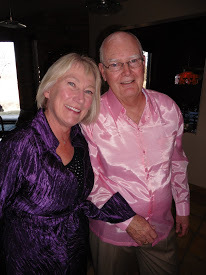 Jerry got the award for most colorful shirt!